Today, for a second time this week, an aldermanic opponent of the Bring Chicago Home campaign attempted to halt our proposal by using a rare parliamentary procedure. The legislation that the Bring Chicago Home coalition introduced must be referred to a City Council committee by the Rules Committee. The Rules Committee met Monday and today, but recessed both meetings after aldermen who oppose the resolution called to end the meetings for lack of a quorum, or a majority of the committee – a procedure seldom used by the City Council. At Monday’s meeting, Ald. Brendan Reilly called for a quorum. The meeting was recessed until today, when Ald. Raymond Lopez once again called for a quorum, which was not present. Numerous aldermen challenged the move by Lopez, pointing out that aldermen regularly conduct business without a quorum. They argued that because the issue at-hand was housing Chicago’s homeless population, several opposing aldermen are using this procedure to hide. Bring Chicago Home seeks to increase the Real Estate Transfer Tax on properties over $1 million to generate $150 million per year to address homelessness. In order for this to happen, aldermen must vote to include this as a question on the ballot for voters to weigh in on before City Council can increase the tax. Those aldermen who are thwarting the legislation are trying to avoid going on the record against a measure that would help Chicago’s 80,000 people experiencing homelessness. Even worse, they are denying voters the chance to have their voices heard on a proposal that they support. Aldermen who spoke up at today’s meeting in favor of moving Bring Chicago Home forward are Aldermen Moreno, Maldonado, Burnett, Mell, Rosa, and Garza. 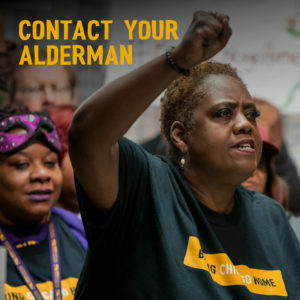 Other aldermen present at the meeting in support of Bring Chicago Home were Aldermen Arena, Cappleman, Dowell, Harris, Santiago, and Waguespack.